Recipes so easy, even a … Well, you know! This recipe was honored with a FoodBuzz Top 9! new C3 posts by email. Hence, the start of a fun new series here on C3: Road Trip Hits. Taking a page from Guy Fieri’s Diners, Drive-Ins & Dives, this ongoing series will feature some of those little known paragons of road-trip rations. I have always avoided Santa Rosa like the plague. All because of a rather large guy named Edd Hoyt … or Jabba The Hoyt, as he was known by some. He was a General Manager at a station I worked at early in my radio career. And, he lived to make most of the station’s employees lives, including mine, a living nightmare. He once confessed to me, as he gleefully walked down the hallway after firing a colleague, that he got a bigger rush out of firing somebody than he did from drugs. Back in those days, he did a lot of both … or, so it seemed. So you can see why, when Jabba left the radio station to run his own piece of the broadcast industry in quaint little Santa Rosa, I not only breathed a mammoth sigh of relief, I also vowed never to spend one minute in the northern California town. I wouldn’t even stop there for gas! However, Edd vacated the town several years ago, or so I was told. Even if he hadn’t I think I can take him now. 😉 Regardless, I couldn’t wait to hit the town for a stop at our next Road Trip Hit: Hank’s Creekside Restaurant (2800 4th Street Santa Rosa, CA 95405-4743 707-575-8839). While most of the venues in this series will be found purely by fate, I have to admit that Guy Fieri first previewed Hank’s in his D3 series. For good reason … it rocks! While waiting outside the short 15 minutes for our table we met a lovely retired couple who, for years, had been frequenting Hank’s several times a week. “You can’t order a bad thing on the menu, ’cause they don’t have one”, the gentleman told us while also exalting the virtues of their coffee – “The best I’ve ever had!” The former was music to my ears, while the latter went in one ear and out the other being that I don’t drink java (that’s a story for another time). But, the Cavewoman was eager with anticipation about the prospects of an incredible cup of coffee, as she has told the Cavekids and me on occasion that she likes her cup of Joe better than she likes us! We soon found out for ourselves that our new acquaintance was dead-on on both accounts. I was close to ordering the house special, Joe’s Scramble, but the allure of the Crab Cake Eggs Benedict was too much for me to bear. The Cavewoman opted to split some Fresh Blueberry Buttermilk Pancakes with the Cavegirl while the Caveboy went with a “small” order of French Toast. I must say, the house special is going to have to be so off-the-hook incredible if it is going to be in the same league as the Benedict. The Dungeness Crab used in the cakes is so fresh and the filling almost non-existent – it’s amazing the cake holds together. 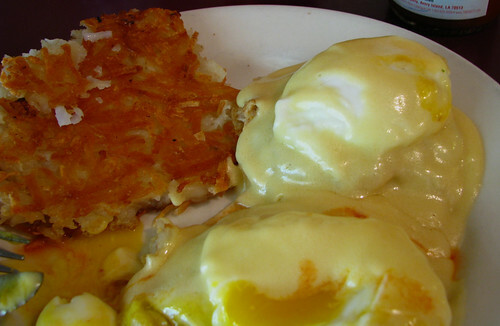 Plus, the flavor it brings to the lemony Hollandaise Sauce and poached-to-perfection eggs is such a perfect combination, you’ll have to really force yourself not to exude sighs of gastronomic pleasure. Though, I didn’t have the strength! I never got a bite of the Caveboy’s dish because he inhaled it before I could stop mewling long enough to even think about it. 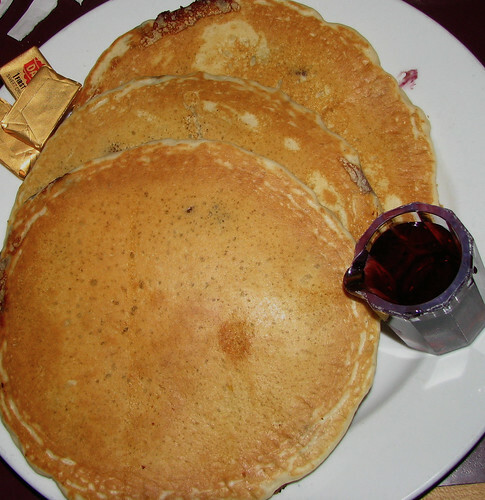 Though, I did get in on some of the girls’ Blueberry Pancakes. Boy, am I glad I did! That may have been the best pancake I’ve ever tasted. Fluffy, yet dense. Yes, I know that sounds dichotomous like soft, yet hard; easy, yet difficult; or skinny, yet fat. But, that’s exactly how they were, with just the right amount of Blueberries, too. As we sat and ate our delicious meal, with a great view of the kitchen counter (and the flowing creek outside, too), plate after plate of amazing looking food kept being swept away to the tables around us. I’m surprised the waitpersons didn’t get annoyed when we continuously asked, “What was that?!?”. 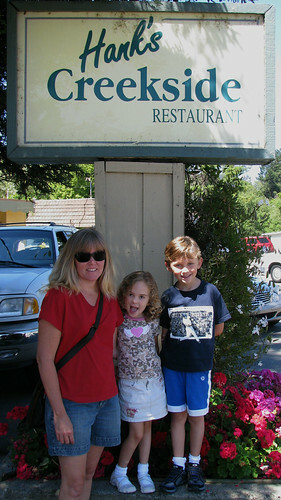 It certainly was enough to entice us to come back and try more of the inviting creations Hank’s has to offer. Besides, the Cavewoman exclaimed with her first sip of morning brew, “This is the best cup of coffee I’ve ever had!” So, if nothing else, we’ll be coming back for the perk. ©2010 Caution: Caveman Cooking/UHearMe, Inc. All rights reserved. This originally appeared on the Caution: Caveman Cooking blog at http://cavemancooking.net authored by Caveman. This may be shared and reprinted as long as this entire copyright message accompanies it. I find that, more often than not, I am much better off “following my gut”. And, not just for filling said bottomless pit. It’s weird how, at times, your instinct just kicks in, and you know that you must follow that path, no matter how blind of a journey it may be. It is with that frame of mind that I have approached this particular road-trip. Sure, I have a few stops in mind. But, other than the McDonald’s a mile from our new Cave that provides one of the all-time-great early-morning travel fare (the Sausage Egg McMuffin with Cheese), and the overnight stay at our cousin’s house in Mill Valley, we haven’t hit one! We’ve just gone with the flow. It is that flow, that belief in going with “feel” rather than “thought”, that brought us to Santa Maria, California, home to our first Road Trip Hit stop … La Coqueta (118 West Chapel Street Santa Maria, CA 93458-4302 805-739-1124). The Cavewoman was craving good, authentic Mexican food. 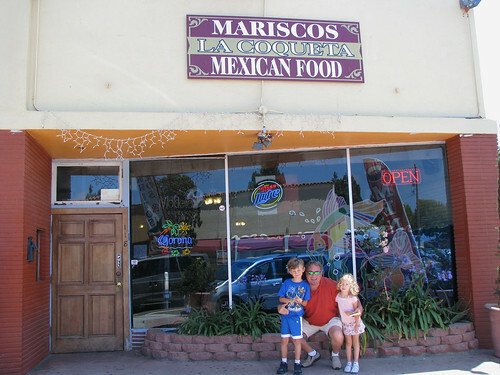 As we traveled up Highway 101 into the southern stretches of Central California, we were getting into areas I had passed through numerous times, but was only familiar with one or two local purveyors of good eats. None of which had anything on the menu originating south of the border. But, when we saw “Main Street” as one of the upcoming exits on the overhead signs, I felt something in my gut. Yes, hunger pangs were making their presence readily felt. However, this was something different. Something that just said, “Get off here, you knuckle-dragging Neanderthal!”. So, I did. My gut kept us going down Main Street in a westerly direction for a couple of miles. Then, it had me make a right one block past Broadway (yeah, Broadway & Main … I can’t make this stuff up! ), then the next right onto West Chapel Street. And, there it was! I mean, you look at this place and it immediately screams, “AUTHENTIC MEXICAN FOOD!”. We parked the car, pried the Cavekids away from their movie in the back seat (Lion King 1 1/2), and took our first tentative steps into our intuitive find. I should have known that, with the World Cup matches being blasted with Pablo “Goooooooooooooooal” Rameriz’s spanish account of the action, we were in the right place. Though, that confirmation didn’t actually come until we sat down and took that first bite of the complimentary chips and salsa. Much as you know whether or not you’ll like a new haircut as soon as you glance up into that mirror, you know whether or not a Mexican restaurant has any chance of being good with that first taste of fried tortilla and tomato/onion/garlic/cilantro. This place rocked the chips and salsa. 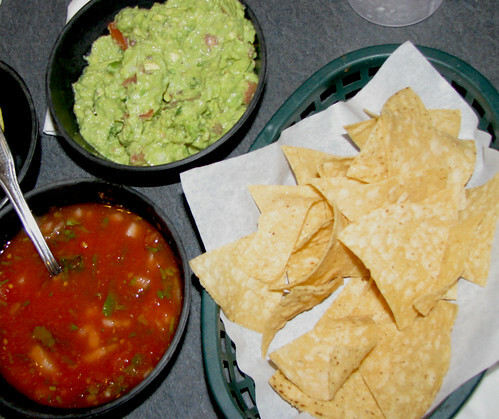 We added an order of guacamole to start things off … that, too, was a good choice. 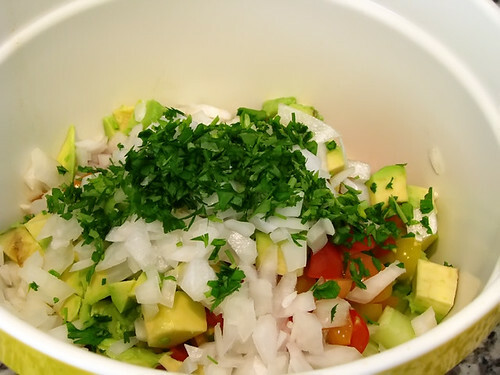 Creamy, yet still plenty of avo-chunks to go along with the tomatoes, onions, cilantro and lime juice. This was the real deal! Plus, the serving size was more than enough for the four of us. Then, it was time to order our main courses. My head kept telling me to go with the Chile Verde plate, but my gut was screaming, “Get the Carnitas, you mouth-breathing fossil-head!”. Who am I to argue with success??? I went with the latter. The kids ordered up some a la carte soft tacos in pollo (chicken) and carne asada (steak) configurations while the Cavewoman went with a Cheese Enchilada. The made to order food arrived fresh and hot … and goooooooooood! The Caveboy annihilated both of his tacos before Pablo finished screaming “Goal!” on the TV, the Cavegirl left her plate so clean it didn’t seem to have been used, and the Cavewoman accomplished a rare feat for her – finishing her entire plate! 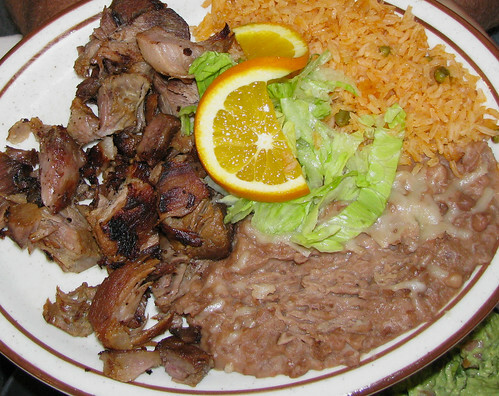 As for the Carnitas, it was as authentic (and delicious) as it comes, and done just the way I like it: a nice “bark” on the outside, yet still tender and juicy on the inside. I just kept slapping them on the generous portion of corn tortillas, and they just kept going down! Almost as incredible as the food was the price. Our entire meal, including two milks and two Arnold Palmers, was $17 before tip. As they say at Staples, now THAT’S a great price! At home, I probably would have stopped about halfway through and brought the rest back to the Cave for another meal. However, there just isn’t room for leftovers on the road. Even if you have a cooler, there’s always the issue of reheating them. So, as usual when road tripping, I over-ate because heaven forbid you leave anything that tasty behind! 😆 It was worth it. Besides, all I had to do was loosen the belt a little bit, get behind the wheel, and start driving to our next stop. All while my gut jiggled in delight at, both, being full and being right on the money with the La Coqueta call. Winner, Winner! Organic Beef Dinner!! We are extremely excited to announce the winner of our very first giveaway promotion on the C3 site. Erin Neu of New York has won Rocky Mountain Organic Meats “Good Cooking Bundle” – 20 pounds of RMOM’s grass-fed Organic Beef including Sirloin Steaks, Eye of Round Steaks, Cube Steaks, Ground Beef, Ground Beef Patties, Stew Meat, Kabob Meat, Fajita Meat, Chuck Roast, Beef Brisket Roast and London Broil that will be shipped directly to her. Congratulations, Erin! We also want to thank everyone for the hundreds of entries we received. The response to this giveaway was greater than we ever expected for our first online promotion. THANK YOU! Since so many people enjoyed participating, we are already working on our next giveaway. Stay tuned for it sometime after the 4th of July weekend – especially if you like to eat! Speaking of which, the Cave family will be taking a summer road-trip shortly. So, recipe posts will be few and far in between for a couple of weeks. But, be sure to stop by while we’re gone, as I hope to post from the road about some of our adventures … culinary and otherwise. Mission: Take Poppa Mike’s Legendary Gnarly Burgers to the next level. Prepare one Poppa Mike’s Legendary Gnarly Burger patty. The great thing about these burgers is that if you make too many, and if you aren’t having a dozen hungry people over you will make too many, you can freeze them and throw them directly onto the grill another time. Hence, the use of some hockey-puck-hard burgers here. Throw burger onto the grill and cook as usual. 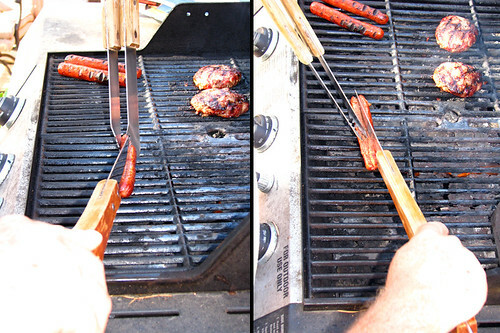 Just before you flip your burger, put the hot dog on the grill. Just before the hot dog is completely done, butterfly-cut it lengthwise. Place onto grill, center-side down. Place cheese onto burger (any type is fine, but there is something to be said about the flavor combo the good old American slice gives this burger). As cheese begins to melt, cut dog in half crosswise. 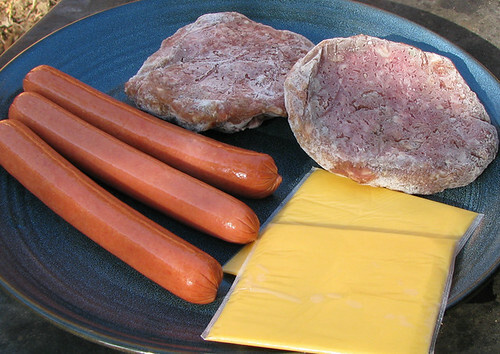 Place hot dog halves side by side on top of cheese and leave on grill until cheese is sufficiently melted. 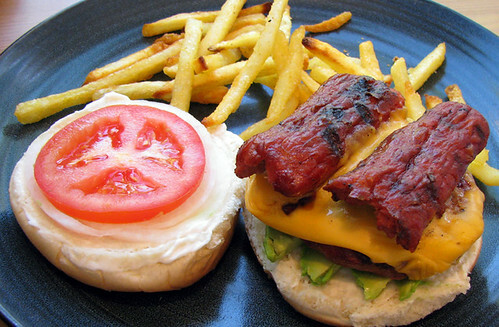 Place combo burger onto bun prepared with avocado, tomato, and onion slices. Add condiments to taste. 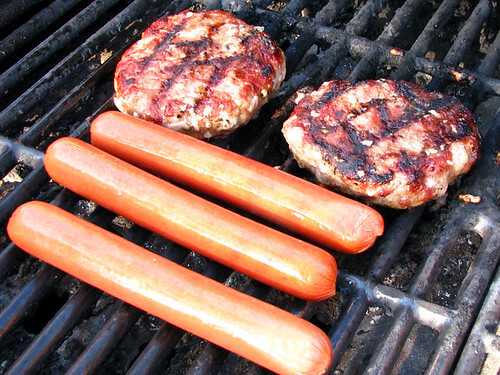 SIDE NOTE: Chances are, when you are having a BBQ with burgers and dogs, you are going to have, at least, one of each. So, why not combine them into one great sandwich? You won’t miss the extra bun, and the flavor combination will make you wonder why you haven’t tried this before. The only downside is that everyone who is having a plain burger or dog will want a bite! 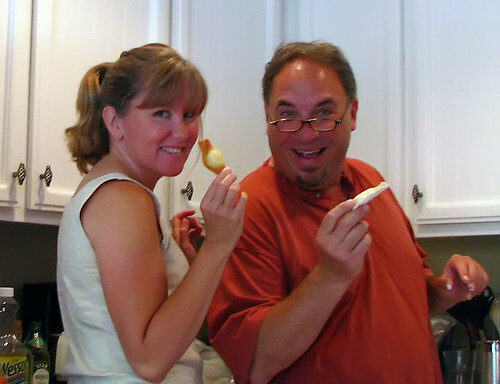 ©2009 Caution: Caveman Cooking/UHearMe, Inc. All rights reserved. This recipe originally appeared on the Caution: Caveman Cooking blog at https://cavemancooking.wordpress.com authored by Caveman. This recipe may be shared and reprinted as long as this entire copyright message accompanies it. Well, we finally did it! We had our first major family get-together in the new cave. It only took three months … speed is not my strong suit. Not that we haven’t had company, mind you. 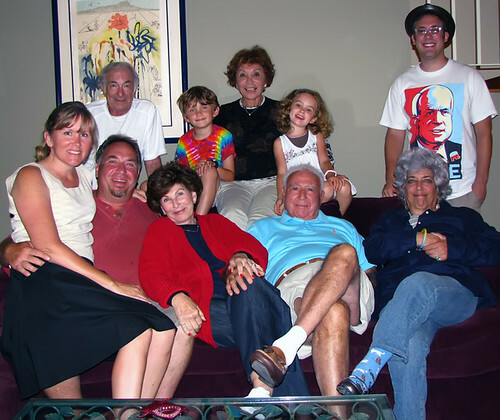 The Cave-in-laws have been over several times and we have hosted a number of friends, as well. But, this was the first multi cave-family gathering we have entertained since our big move back in March. The guest list was a who’s-who of the Cave Clan, including the Cavemom and her husband; several Cavecousins; my Cave-Godmother and her spouse; and, of course, the four of us. No special occaision, other than the fact the my Mom and Step-father were in town staying with us for a few days. Besides, any day ending in “day” is a good time for a party! My original plan was to try something new for our guests to enjoy for dinner, since I’m always game for unfamiliar culinary territory, and it would give me more fresh recipes to share with you. But, there was overwhelming demand for several dishes that have already graced the pages of this cyber-rag. Although, we did throw one new salad into the mix … and boy, was it goooooooood! But, let’s not get ahead of ourselves here. There are stories to share and details to divulge of this inaugural Neanderthal gathering. First, I must thank my godmother/cousin Arlene and her husband Leon for this wonderful and thoughtful housewarming gift. Even though we requested that nobody bring presents, because we had nowhere to store anything else, Arlene was not going to come empty handed. As the Cavewoman pointed out, Arlene always comes up with the most unique and personalized presents. 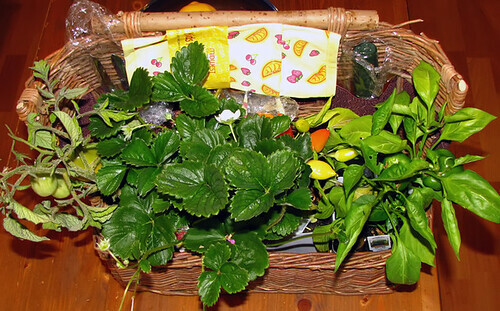 She put together this great basket filled with tomato, strawberry, and pepper plants along with all the tools and foods necessary to grow big, producing plants. In fact, they are all getting planted today by the Cavekids! Once everyone arrived, we served drinks and quickly set out some Hummus, Harif (Yemenite Hot Sauce) and warmed Flat Bread that I had just whipped up, and recently featured in our Middle Eastern Epicurean Excursion. 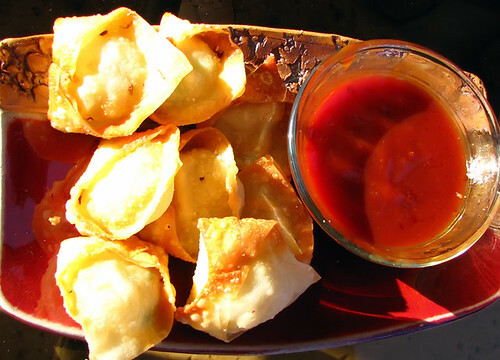 While everyone was enjoying the Mediterranean treats, I started frying up some Crab Wontons. Normally, I make these with King Crab. However, I just had a yen for some Blue Crab. Especially in light of the fact that they will become increasingly harder to get with the damage being wreaked by the oil-spill disaster in the Gulf of Mexico. For my veggie wife I made a bunch of them without the crab meat. Being a good chef means tasting your dishes before you serve them to your guests … at least, that’s the line being towed! The Caveboy snuck in with the camera and busted us sampling the wares. While everyone was enjoying the company, libations and hors d’oeuvres Cavewoman and I started preparing the main meal. 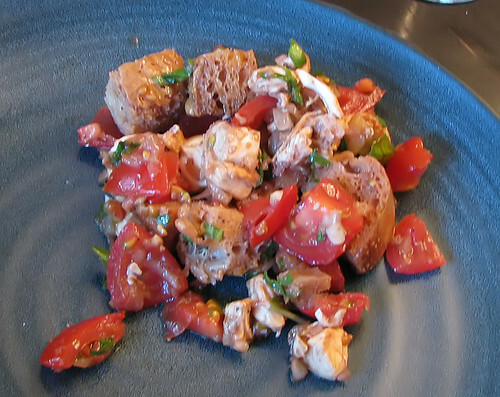 She went to work on a Chopped Caprese Salad with soaked homemade croutons – the new dish I mentioned earlier. Unfortunately, it’s not the best picture of the salad. But, trust me, it is fantastico! I promise much better shots when we post the recipe. 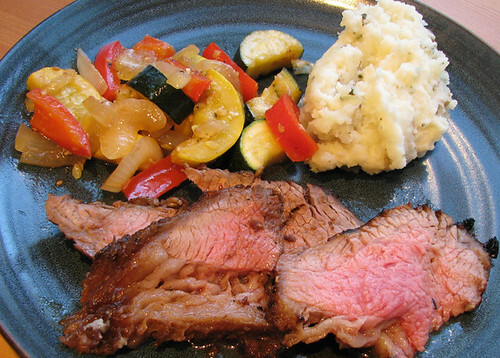 For the main course, we served Tri-tip marinated for 34 hours in Teriyamic Marinade, Garlic-Basil Mashed Potatoes, and Sauteed Asian Veggies. Obviously, we haven’t posted the potato recipe yet. But, it is a very easy and tasty side-dish that we will share soon. EDIT: Here is the recipe for the Garlic Mashed Taters. We ended our fabulous meal with some of Cavewoman’s incredible Chocolate Chip cookies and a heaping plate of Leon’s world famous Mandel Bread (a recipe I’m still trying to wrangle out of him), which is kind of like Jewish Biscotti. His is the best I have ever tasted, and I just can’t seem to stop my hand from grabbing piece after piece when it is in front of me … or even at the other end of the table! Needless to say, our first mass convening of the Cave Clan was a huge success. Everyone was full, happy, and smiling as they waddled over to the couch or overstuffed chair closest to them. The only problem with gatherings like this is that they end too quickly. But, I guess that’s just one more excuse to have yet another party soon … real soon! Wherever you travel in the Mediterranean, from Lebanon, to Israel, to Turkey and beyond, Hummus seems to be a mainstay as a side dish and/or appetizer. For good reason … it’s gooooooooood! And so easy to make, as well. So, it only seems fitting that we wrap up our weeklong epicurean excursion to the Middle East with this Caveman’s version of a classic regional dish. 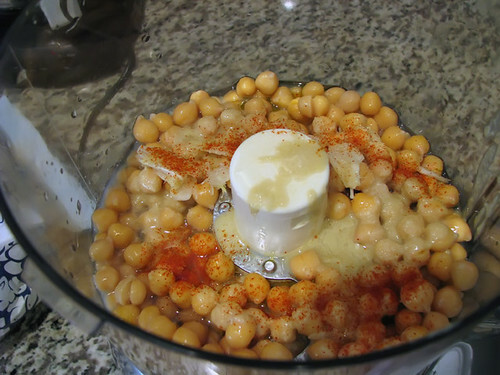 Drain garbanzo beans, reserving 1/4 cup of the canning juice. 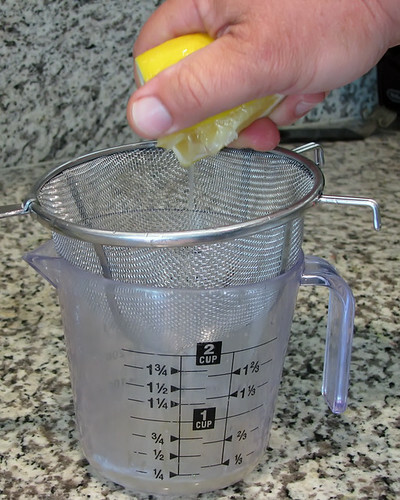 Squeeze and strain the juice from a fresh lemon until you have 3 tablespoons worth. About half a lemon usually does the trick. HINT: Again, I can’t stress enough how using Meyer’s Lemons in these recipes makes such a huge difference. Use them if at all possible. 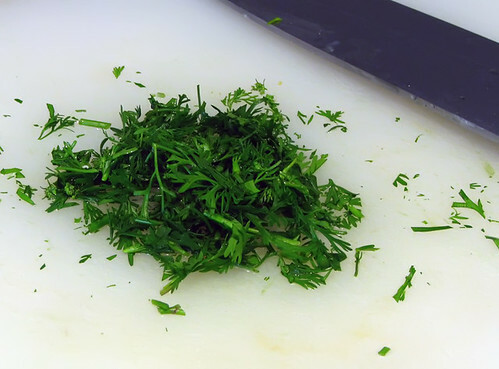 Place all ingredients, EXCEPT PARSLEY, into food processor. 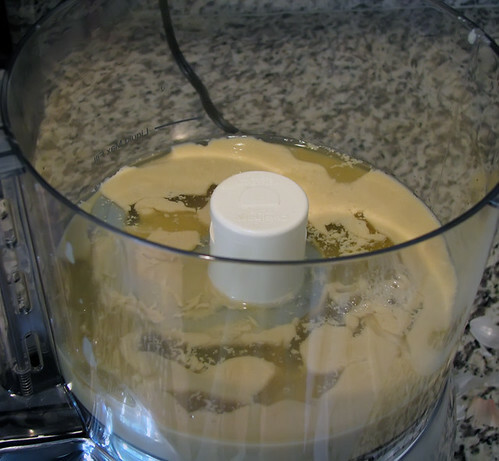 Process on high setting for about 2-3 minutes, until mixture is creamy and semi-smooth. HINT #2: This will never get as smooth as the Tahina Sauce. So, don’t over process it trying to get it to that consistency. A very slight grainy appearance is expected. To properly plate when done, with a rubber spatula scoop out enough to more than cover the area of the serving plate. 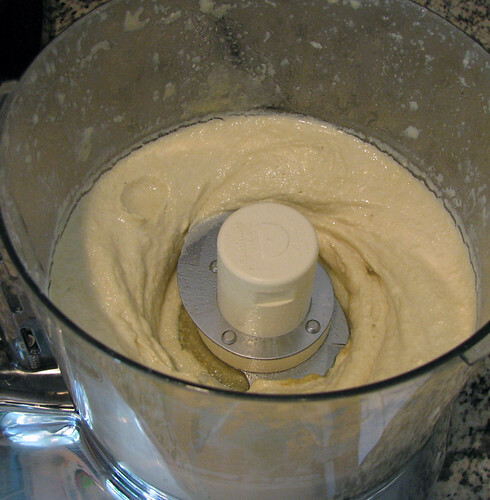 Smooth out the Hummus, kind of making a wheel shape out of the hummus. Be sure to leave a little round reservoir in the middle of the “wheel”. Pour a little Olive Oil into the center reservoir. Then, dust dish with Paprika. Finally, top hummus with finely chopped parsley and serve along side your favorite Mediterranean dish. Pictured here with Falafel, Pita Bread, Tahina Sauce, Caveraeli Salad, and Harif. We hope you’ve enjoyed our culinary journey over the past week. 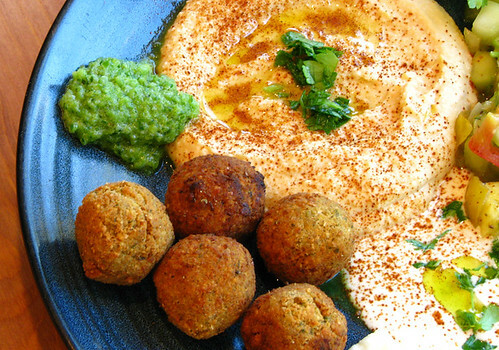 We’ll be adding more recipes to this regional list in the coming weeks, including my promised Falafel recipe … I still need to try one more tweek before it is ready for public consumption. ©2010 Caution: Caveman Cooking/UHearMe, Inc. All rights reserved. This recipe originally appeared on the Caution: Caveman Cooking blog at http://cavemancooking.net authored by Caveman. This recipe may be shared and reprinted as long as this entire copyright message accompanies it. If you know me, you know that I love my hot sauce. From pepper sauces, to chili oils, to curries, I pretty much like ’em all! So, it should be no surprise that a Middle Eastern variety makes a showing in this continuing tasty trip. This sauce (pronounced ha-REEF) also works great with Mexican, Asian, and seafood, besides the usual dishes it traditionally accompanies. Best of all, it is sooooooo easy to make! 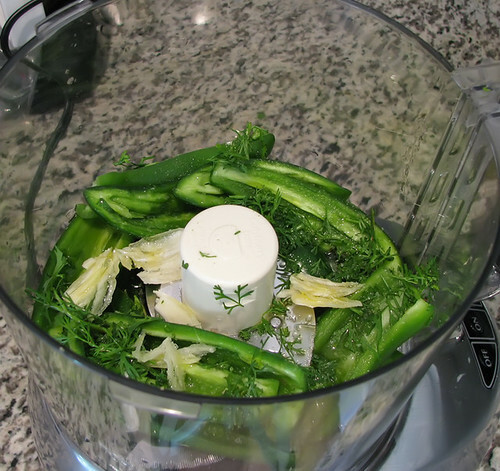 Place all ingredients into food processor. 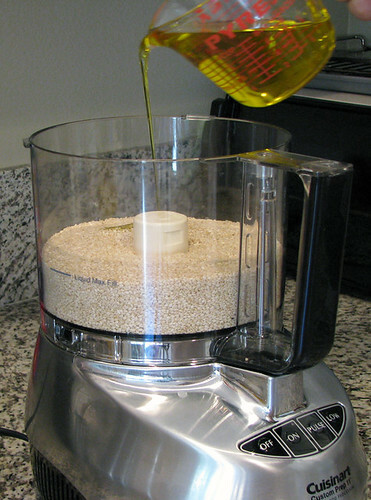 Process on high for 1-3 minutes, until mixture becomes a coarse sauce. Serve with any regional dish. Pictured here with Falafel, Hummus, Tahina, Caveraeli Salad, and Pita Bread. 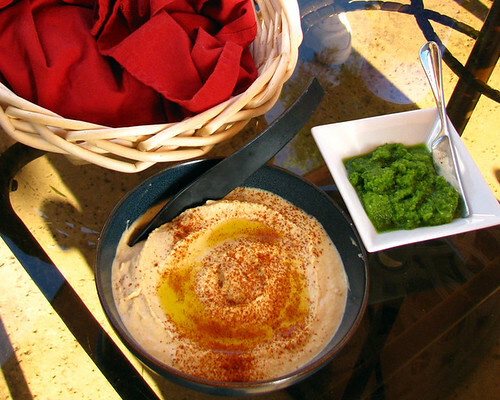 Tomorrow we end our journey with the quintessential Mediterranean dish … Hummus! Our culinary journey to the Middle East continues with a Cali-Caveman’s take on the classic Israeli Salad. The great thing about this recipe is that it compliments many Western dishes, as well. A tasty, delicious, refreshing salad that works especially well in the warm weather months. Dice cucumber, tomato and onion. 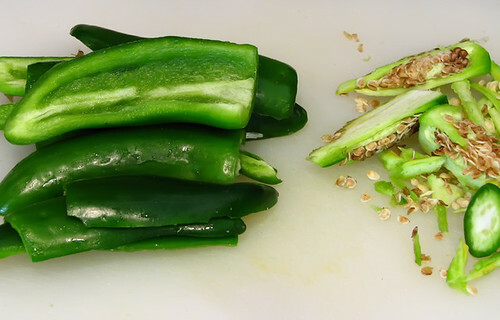 HINT: Traditionally, this recipe calls for Roma Tomatoes. However, you really can use whatever variety you wish. For this dish, I went with Heirloom Cherry Tomatoes for their color as well as their flavor. Chop onions and mince parsley. Place all the above into a large mixing bowl. Seed lemon and then squeeze juice over ingredients. Add Olive oil and Celery Seeds. 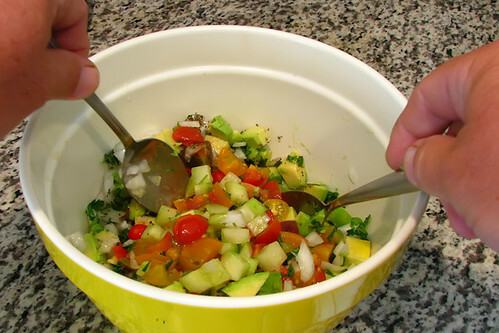 Gently toss salad until all ingredients are thoroughly mixed. Serve immediately or cover and refrigerate. 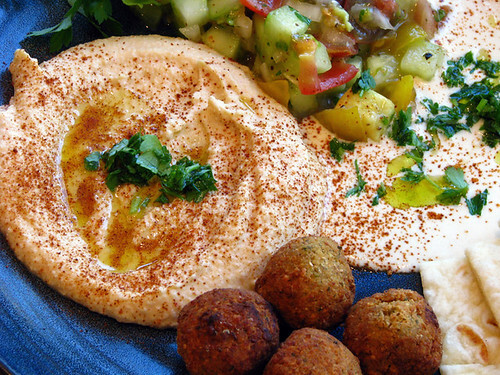 Plate with Hummus, Tahina Sauce, Baba Ghanouj, Falafel, Kabobs, Pita Bread, or any other regional dish. Or, add some Grilled Shrimp and turn it into an entree. This salad is so versatile … and so gooooood! SIDE NOTE: As a teenager, I actually lived on the traditional version of this salad and Chicken Schnitzel for three months and got quite burned out on it. It took me years before I could even think about being in the same room with this salad! When I finally decided to give it another chance, I knew I had to give it a different spin if I was going to eat it on any type of semi-regular basis. This recipe was the result. By the way, I still can’t bring myself to come face to face with Schnitzel. We continue our culinary journey to the Middle East with the sauce derived directly from the Tahini Paste we learned to make yesterday. 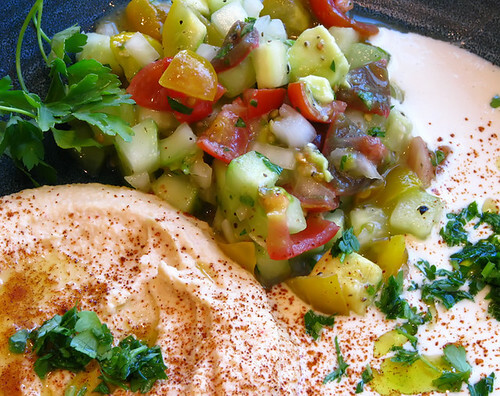 This is a great sauce to put on top of Falafel, Kabobs, Salads or just as a dip for Pita Bread. 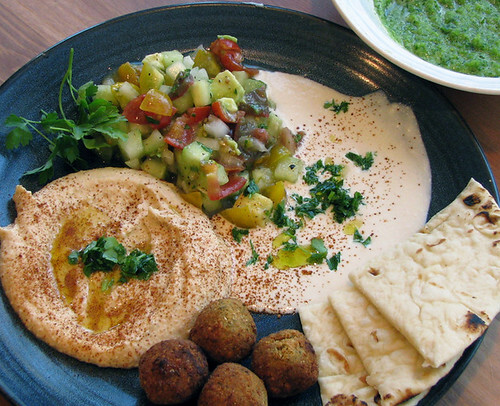 The great thing about Middle Eastern food is that it all just seems to go together so well. 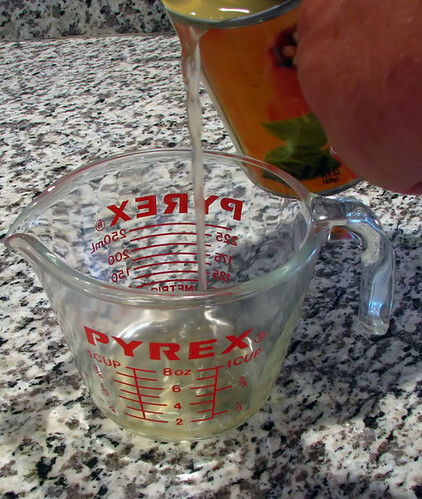 Squeeze the juice from 2 to 3 lemons, through a strainer. You’ll need about 1/2 a cup. Set aside. Peel, then crush three cloves of garlic. Set aside. 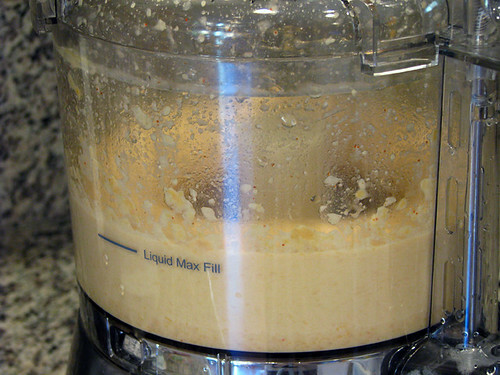 NOTE: If you are going to use a blender or food processor for this recipe there is no need to break out a garlic press. Just take the side of your chef’s knife and apply pressure with your palm until it gives way. 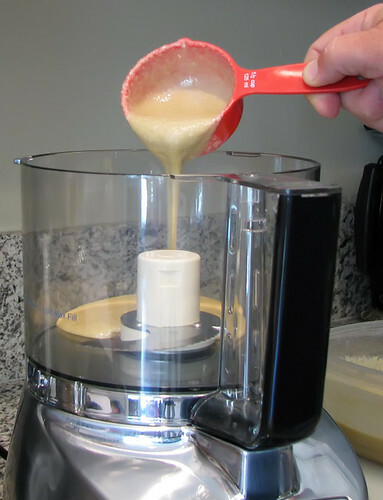 Pour 1 cup of prepared Tahini Paste into food processor. Add garlic and lemon juice to paste. Puree until white and creamy on high setting. 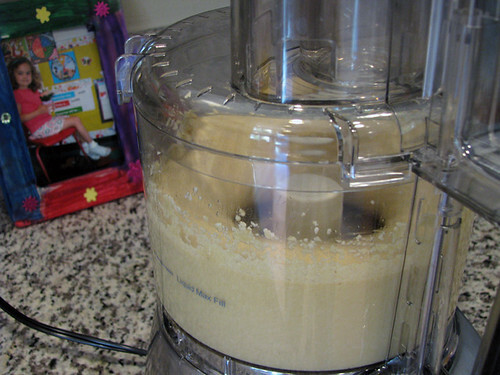 Now, with the processor on a low setting, add salt 1/4 teaspoon at a time and slowly add water a 1/4 cup at a time. 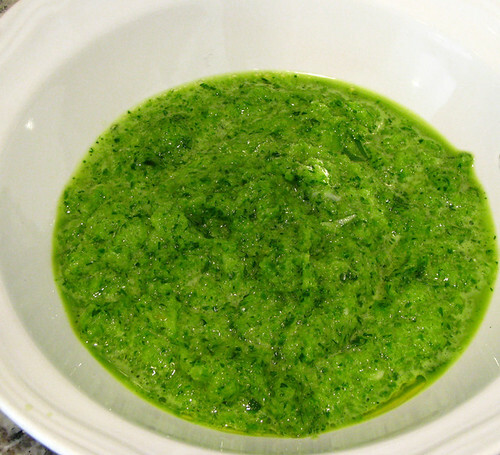 Sauce is ready when white, creamy, smooth, and tangy to the taste. You can add more salt of lemon juice if needed, but it should be good to go as is. You can serve immediately, but I think it’s best after it’s been refrigerated for several hours in an airtight container. Should last about a week. When you are ready to plate this sauce, drizzle some Olive Oil on top, dust with Paprika, and scatter some chopped parsley over it. SIDE NOTE: I’m sure many of you are saying to yourselves, “Great, Cave! You’ve given us a paste and a sauce made from the paste … now what?!?!”. Can’t say that I blame you, but I have to give you all the base recipes so that by the end of this epicurean excursion you’ll be able to make everything you see here, save for the pita bread and the falafel, for a Middle Eastern feast. Why no bread? Well, I just leave the baking to the Cavewoman. As for the falafel, I’m not totally happy with my recipe yet so it’s just not ready to share yet. But, I think I may have discovered the magic ingredient … if it works again I’ll share it immediately. This is the first, and perhaps most crucial, recipe of our week long culinary journey to the Middle East. You probably won’t want to eat it straight. But, if you are going to make just about any of the regional dishes, from Hummus to Falafel to Baba Ghannouj, you will need this simple little preparation as an ingredient. The good news is that you can make it ahead of time and it should last up to three weeks in the fridge. Preheat oven to 350. 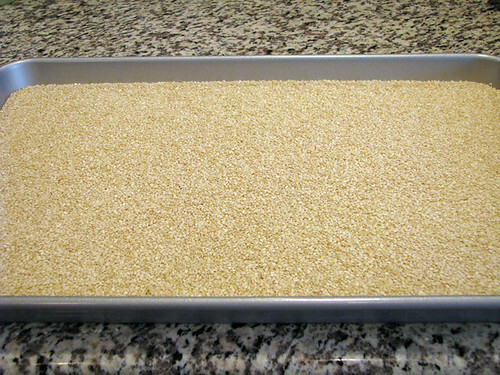 Spread sesame seeds evenly on large baking pan with raised sides. 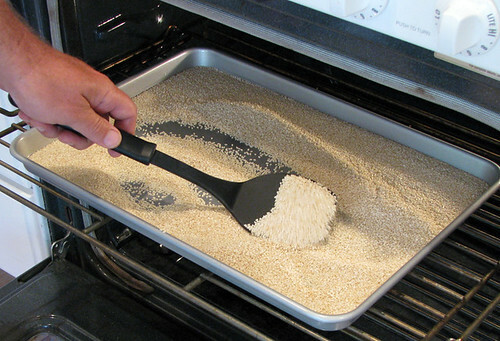 Place baking pan into oven to toast very lightly. You don’t want them starting to to turn brown. Be sure to toss and stir them often until done. Let cool for 15 minutes. 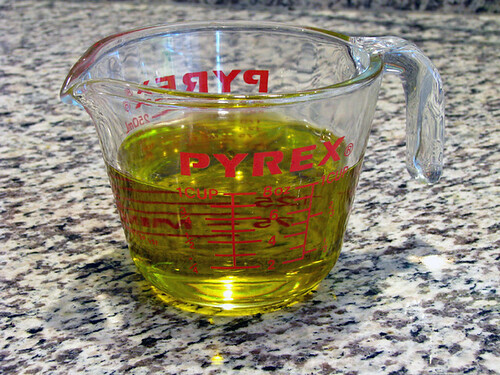 Prepare one cup of olive oil. I like to use Extra Virgin (insert joke here ;)), but regular works, too. Just stay away from using the “Light” or “Extra Light” varieties for this application. 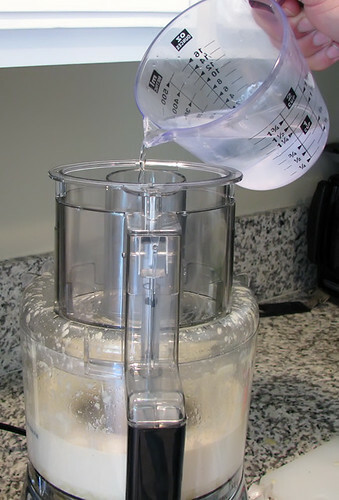 Place cooled seeds into food processor. Add oil evenly. 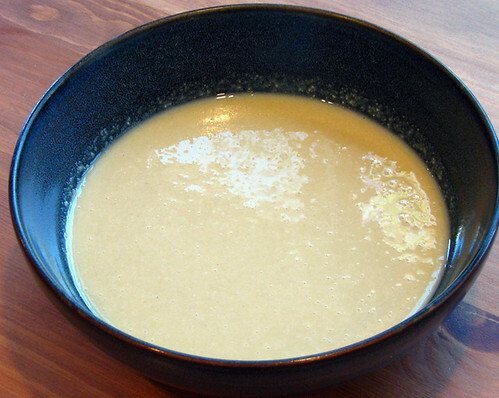 Puree on high for 3-5 minutes, stopping occasionally to scrape sides with a rubber spatula. You don’t want any whole seeds left. 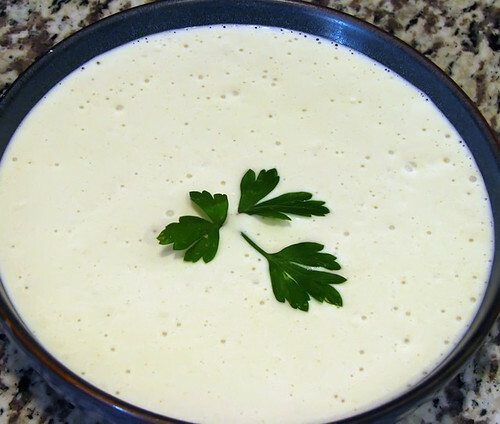 When smooth and creamy, pour into an airtight container and refrigerate until ready for use. NOTE: There has always been a bit of confusion over the terms “Tahini” and “Tahina”. Some folks use them interchangeably … but they would be wrong. 😉 The way it was explained to me years ago by an Israeli chef, Tahin-EE is the paste which we are making here. 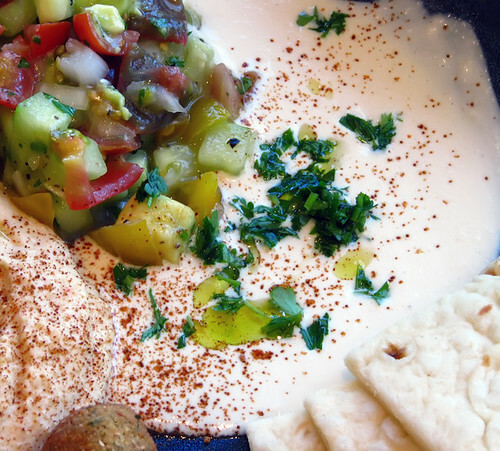 Tahin-AH is the smooth, creamy, delicious sauce you pour over falafels, salads, kabobs, and more. Guess what’s on the menu for tomorrow?! ?